Juriy Zaytsev just released a brand-new Prototype 1.6.0.2 cheat sheet that is a great time-saver for development and also makes a nice wall poster. As a nice bonus, it lists deprecated methods, too—time to get rid of those in your code. 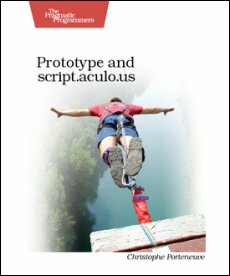 The Bungee Book on Prototype and script.aculo.us is now shipping, in both PDF and paper versions. A big thumbs-up for Christophe who painstakingly wrote the book to be the best and most up-to-date reference to both Prototype and script.aculo.us there is. Don’t miss this one! Read more over at the Bungee Blog. A shoutout goes to Amy Hoy for taking the awesome pictures and doing design consultancy for the site! Btw, the site uses a preview-ish version of the upcoming script.aculo.us 2.0 effects framework, so if you’re curious to see that in action, i’d suggest you take a peek. As part of today’s triple release celebrations, script.aculo.us 1.8 is now available for your download pleasure! To download it, head over to the script.aculo.us site and head for downloads. And all of it is sweetly documented in Christophe’s Book on Prototype and script.aculo.us. As we head towards script.aculo.us 2.0 (I hope to have a preview release ready soon! ), further releases of script.aculo.us 1.x will be bug-fix releases only. If you should stumble upon anything, please follow the directions given on the Prototype contribute page (these instructions are valid for script.aculo.us too). Last but not least, as always, thanks to the many contributors and the great community! 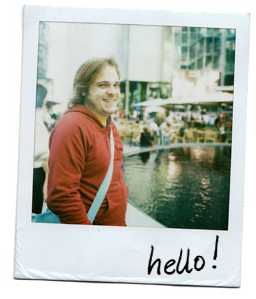 Coming to Vienna, Austria on November 10 and 11: The EURUKO 07, the 5th European Ruby Conference. Here are my slides from the talk I just gave at the RailsToItaly 07 conference. Btw, Pisa is a nice city, except that it’s very rainy, at least right now. Writing this literally in the shadow of the leaning tower. Dave Troy writes on how his project Twittervision, which is a Rails application powered by Prototype and script.aculo.us, is going to be on exhibit at the New York MoMA (Museum of Modern Art). The exihibition opens on February 24, 2008. Today, creativity and imagination (what some folks are calling the right brain) are becoming the key drivers of software and design. With imagination, we can see around the corners of today’s most pressing challenges. As always, you’ll find more detailed information in the CHANGELOG. Download it over at the script.aculo.us site, 196k zip file.